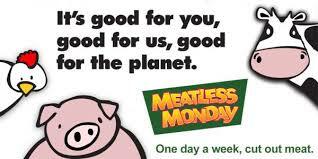 Meatless Monday is a global movement to help people reduce their meat consumption by 15%. Meatless Monday is an initiative of The Monday Campaigns; it began in 2003 and it was launched in association with the Center for a Livable Future (CLF) at Johns Hopkins Bloomberg School of Public Health. Meatless Monday is now active in 36 countries. Because going meatless one day a week may reduce your risk of chronic diseases such as cancer, cardiovascular disease, diabetes, and obesity. In addition, reducing meat consumption can help reduce our carbon footprint and save precious resources like fossil fuels and fresh water. Monday influences our mood and health outcomes and, according to research, on Monday people are more willing to engage in healthy behaviors. It’s easy. Don’t eat meat on Mondays!! You can get tasty and healthy recipes, along with more information about the benefits of going meatless on Monday and the history of the movement by clicking the links below.